What's So Bad About "Smart" Meters? This is from StopSmartMeters.Org, with permission. Thanks so much! Please check the front page for the latest news: StopSmartMeters.org. Check Frequently Asked Questions for detailed information. Do you want an accurate, reasonably priced utility bill? Utility customers have noticed huge increases in their bill after a ‘smart’ meter is installed–in some cases hundreds of dollars more than usual. Utilities claim the meters are accurate,but unexplained over-billing has featured in many negative reports, all around the US. Read more. Do you value your health, and the health of your family and friends? Just as we’re learning that cell phones cause brain tumors, why are we installing the same technology on everyone’s homes, often with no right to opt out? Thousands of people have complained of tinnitus, headaches, nausea, sleeplessness, heart arrhythmia, and other symptoms after a ‘smart’ meter was installed. Wireless technology is a public health hazard. Smart meters can violate already high FCC limits on human exposure to microwave radiation, and are being installed even as people are developing “electro-sensitivity”. There are also reports of ‘smart’ meter interference with pacemakers and other implants. Read more. Do you value civil liberties and the right to privacy? When a ‘smart’ meter is installed, your utility has access to a treasure trove of information about your electricity usage, potentially compromising your privacy. Depending on the regulatory protections–and enforcement of those rules–in your state, they will be able to sell this information to a series of corporations and the government. Read the interview with the Electronic Frontier Foundation about how ‘smart’ meters violate privacy. Read how the ACLU in Vermont and the ACLU in Hawaii have both condemned the lack of consumer privacy protection. Do you care about wildlife and keeping the environment healthy? Smart meters do not result in energy savings, according to Reuters. They may even increase energy consumption. There is also emerging evidence that wireless, non-ionizing radiation (from cell phones, wifi, and ‘smart’ meters) harms wildlife and damages trees. There have been direct reports of how smart meters affect vital bee populations. Are you in favor of fire regulations that put the safety of residents first? A number of electrical fires have been caused by ‘smart’ meters. Like all other smart meters, PG&E’s meters are not UL certified, as is required by electrical code for all electric appliances within the home. Smart meters are potential ignition sources and remove utility personnel from neighborhoods. If meter readers had been present in San Bruno, would the gas leak have been detected? Whistleblowers have alleged unsafe installations. Here is another whistleblower’s story in Alabama. Are you alarmed about the decline of our democracy and informed decision-making? The conversion to smart meters is one of the largest technology rollouts in history, and yet virtually no public consultation with ratepayers or local governments was carried out in advance. The CA Public Utilities Commission, an appointed (not elected) body who are charged with regulating utility companies, ignored popular local opposition for years–though finally and belatedly producing an opt-out in early 2012 that costs PG&E customers hundreds of dollars just to avoid a recognized possible carcinogen. In the rest of CA other utilities continues to install smart meters (Feb 2012). SPEAK OUT! 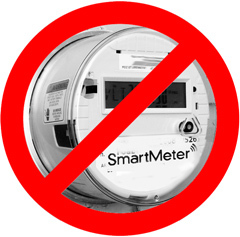 Spread the word to friends and neighbors, put a NO SMART METERS sign under your safe, analog meter, support Senate Bill 459 for a FREE opt out option for "smart" meter. TAKE ACTION, REFUSE installation, and DEMAND REMOVAL! As of Feb. 2012, more than 51 cities and counties have demanded a moratorium. Twelve have even criminalized smart meters. More ways to take action here.